Admission details will be e-mailed to you 2/3 weeks before Memorial Day via Eventbrite e-mail. THIS IS NOT YOUR TICKET TO ENTRY. Arguably our biggest 2018 lineup to date, Drai’s Beachclub and Nightclub brought the very best in hip-hop and dance music for Memorial Day Weekend! 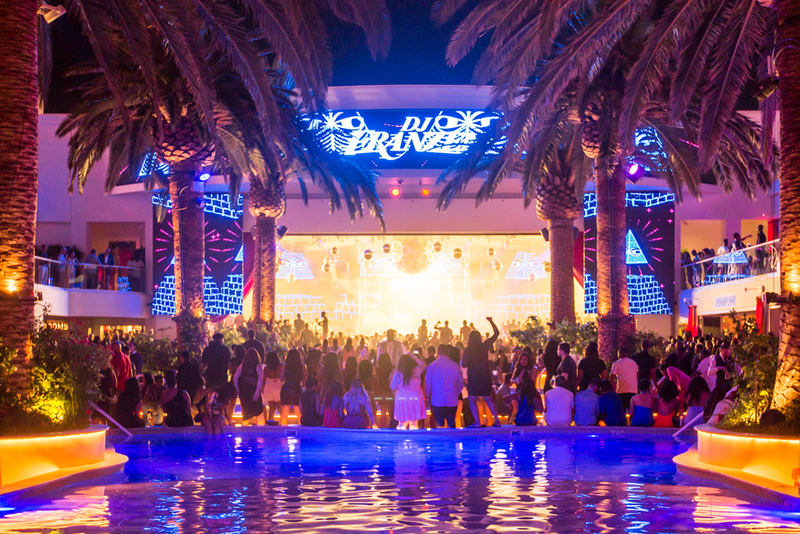 For Drai’s Beachclub on Saturday we saw the 2018 Beachclub debut of Rae Sremmurd alongside A-Trak, and Sunday was R&B sensation Trey Songz with sounds by DJ Pauly D. Friday evening at Drai’s Nightclub was the grand return of Future, Saturday was an exclusive co-headlining performance from 2 Chainz and Trey Songz (along with some very special guests), and we wrapped it up on Sunday with the #1 rap group in the world Migos. A lineup this big means plenty of special guests came out to party: NFL players Von Miller, Captain Munnerlyn, Jamie Collins, Akem Ayers, Keith Smith, Marqise Lee and many more; NBA players Myles Turner, Anthony Davis, Trevor Booker, Iman Shumpert, Brandan Wright, CJ Watson, Damian Lillard and Isiah Thomas; music artists Akon, Desiigner, YG, Playboi Carti, Teyana Taylor and Young Buck; and notable guests Terrence J, Jasmine Sanders, restaurateur Michael Chow and actor John Robinson! RSVP for Drais Memorial Day Weekend - MDW 5/24 NOW!!! If you're not in the club scene, or your only interaction with the club scene is turning up for the music, you might not know the name Victor Drai. That's ok. He put his name all over something you're sure to remember - Drai's Nightclub. It's the place in Vegas for club patrons who know the difference between upscale and just scaled up. An elevator ride above the Cromwell, a sensual boutique hotels on the Las Vegas Strip, Drai's Nightclub continues the Cromwell's attitude of specifically-chic ambiance catering to a crowd of clever and well-off waifs. The clientele can tell that the Strip is changing and they know how small batches of craft work offer greater taste. So coming to Drai's means accepting that the club is as much a place for art as getting wasted. Dress code: Fashionable nightclub attire required. Dress code enforced strictly with management discretion. The following articles are prohibited: Athletic gear and apparel, shorts, torn or cutoff clothing, sandals, athletic shoes, work wear, Jordan shoes/apparel, Timberlands, hats, baggy clothing, chains, offensive prints on clothing, weapons, controlled substances, eye drops, gum, outside food or beverages, liquids, vitamins, supplements, over-the-counter medications, prescription medications without valid prescription, cameras, GoPros, wearable technology, selfie sticks, vaporizers (‘vapes’). Any devices found in use will be confiscated and disposed of by management without compensation. Guests noticeably intoxicated or under the influence of a controlled substance will be denied entry and will not be eligible to receive a refund. All persons, bags & personal items are subject to search. If you remove your shoes you will immediately be escorted out of the venue. We have a zero tolerance policy. Must be 21 years of age with valid form of ID. Management reserves all rights. Total Rewards Seven Star & Diamond members: Complimentary Priority Line access for member plus one guest. Admission not included (subject to change). Memorial Day Weekend (MDW) is the most popular holiday of the year. It strings together a full weekend of nightclub and day club events that bring the world's top DJs and live music performances to Las Vegas. People flock from around the country to party all Memorial Day Weekend long because it marks the official start to the summer. The fans of the beachclubs line up for hours to get in to see their favorite EDM acts and live hip hop performances. By far the most popular day to let loose is Sunday, but Saturday is not far being in popularity. We want to make sure you have access to the top events and are in the know for everything that is booked. For Memorial Day Weekend expect long lines and crowded bars, VIP areas, pool decks, and well pretty much everywhere.